Festival Theatre celebrates it’s 30th season! New Bedford Festival Theatre is celebrating its 30th season and its 2019 production of MAMMA MIA! 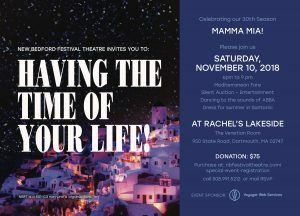 with a special fundraiser: “Having the Time of Your Life!” on Saturday, November 10, 2018 at Rachel’s Lakeside, Dartmouth, MA. The fundraiser will help support Festival Theatre’s varied programs including its highly praised Summer Academy for high school and college students. 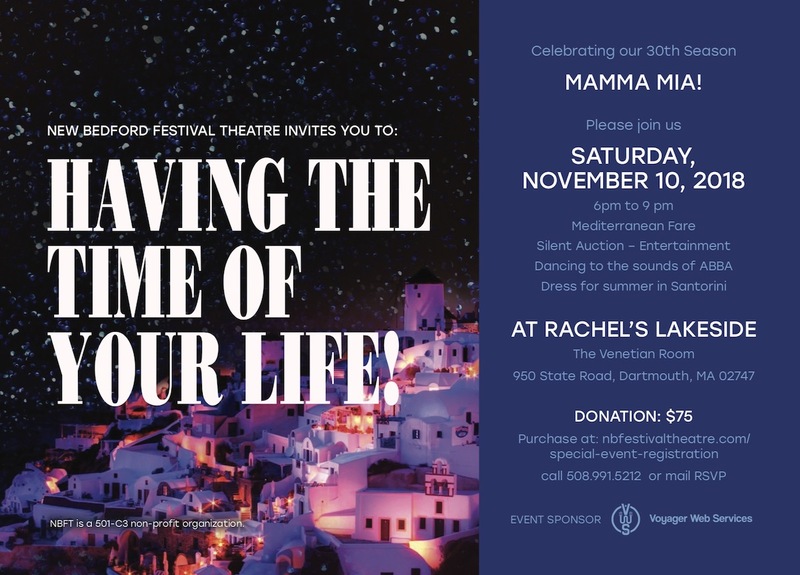 “Having the Time of Your Life!” running from 6pm to 9pm will feature delicious Mediterranean fare, a spectacular Silent Auction, live entertainment, and dancing to the sounds of ABBA whose music is the basis for MAMMA MIA! Reservations at $75 can be made by calling 508.991.5212 or online HERE. The sponsor for “Having the Time of Your Life! Is Voyager Web Services.